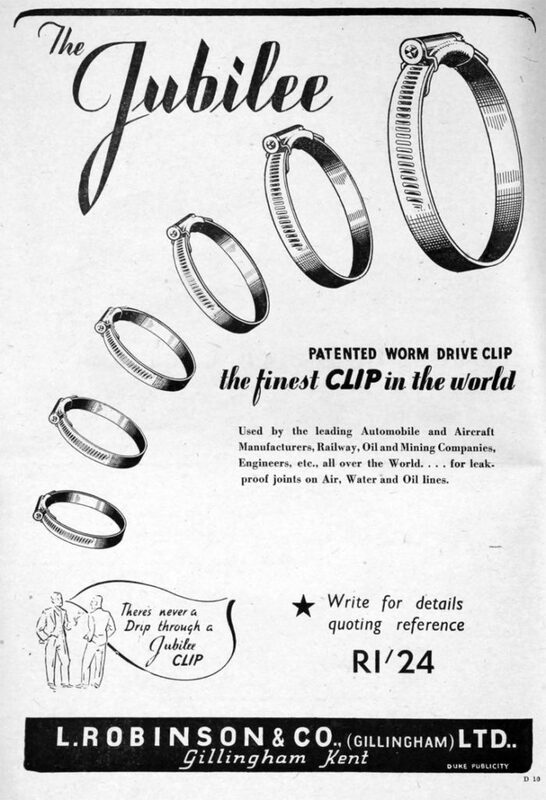 The Jubilee® worm drive hose clip was invented in April 1921 and patented by Commander Lumley Robinson, the founder of L Robinson and Company. Exports soon followed, first to the Netherlands, followed by a number of other European countries and eventually overseas. 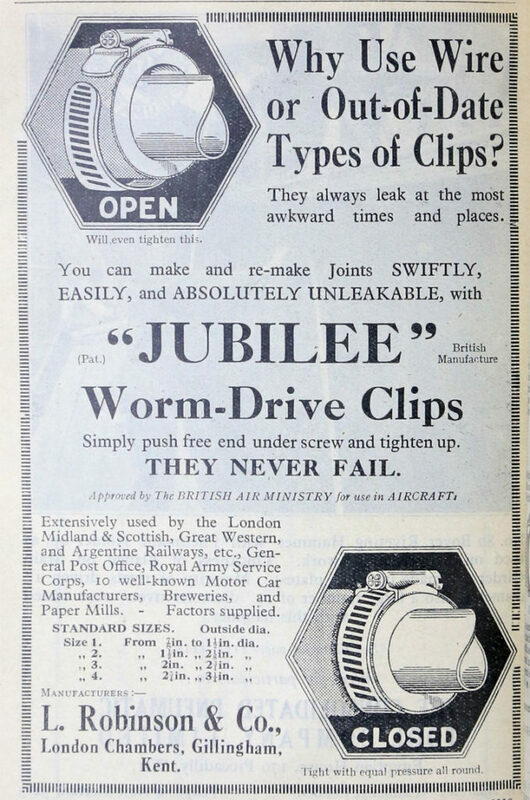 Demand for Jubilee® Clips increased throughout the 1930s, however two weeks before the outbreak of the second World War, Commander Lumley Robinson died suddenly. His wife, Mrs E B Lumley Robinson, took over the reins, and ran the business herself throughout the war. During Battle of Britain, Mrs E.B. Lumley Robinson presented a Spitfire fighter plane to the R.A.F, appropriately named ‘The Robinson Fighter’. After the war L Robinson & Company (Gillingham) Ltd was founded with Robinson’s youngest Son, John, appointed Managing Director and Mrs E.B. Lumley-Robinson at the helm as Governing Director. 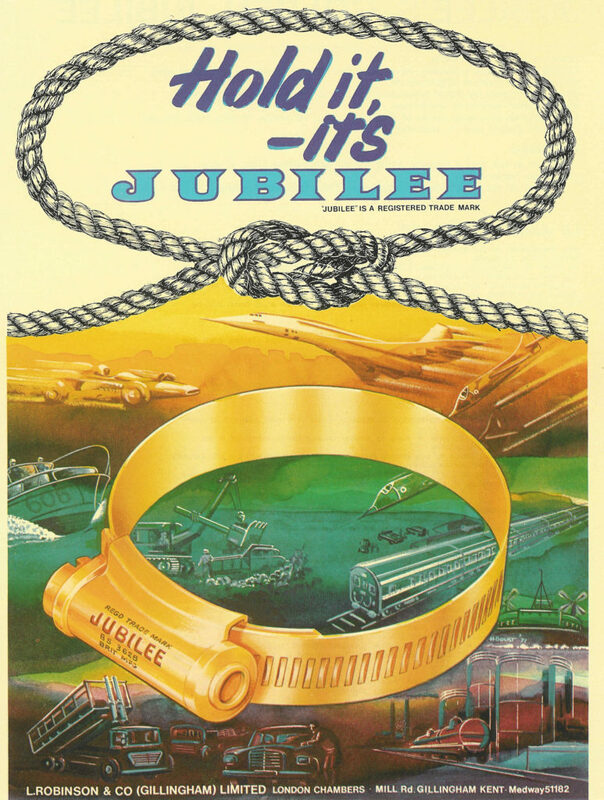 In order to meet high demand in the post-war period, Jubilee Components Ltd was formed to manufacture the quantity of components required for the increased numbers of Jubilee® Clips produced on L Robinson & Company (Gillingham) Ltd’s assembly lines. L Robinson & Co (Plating) Ltd was formed to enable greater control over plating quality and faster throughput. 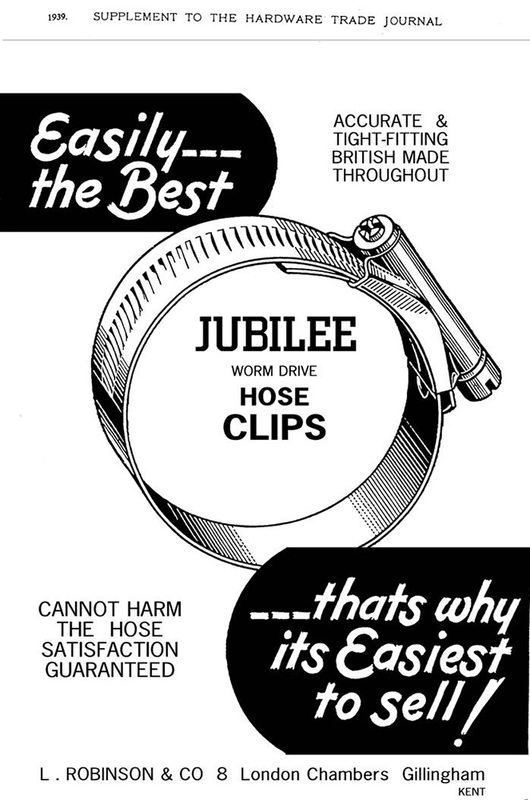 Jubilee® Clips is instrumental in the creation of the first Kitemark approval for Worm Drive Hose clips BS3628:1963 up to and including 6 ¼ inch diameter. A number of iconic vehicles including the cross channel hovercraft, the Hawk training and Harrier jump jets and Concorde were fitted with Jubilee® Clips. 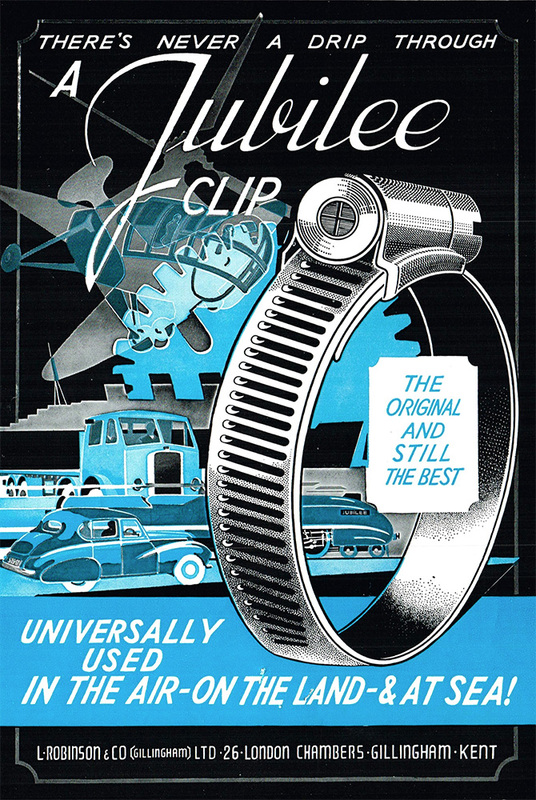 Jubilee® Clips’ reputation was further enhanced with the company exporting to the quality conscious Japanese market. 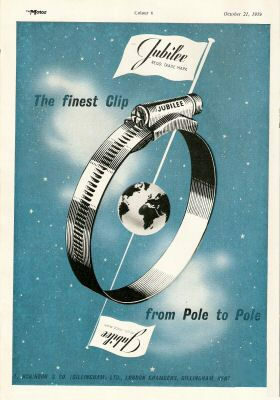 Jubilee Clips Ltd was founded as the company taking care of the assembly of Jubilee Clips. In 1977 the metric Kite Mark KM06246 for BS5315:1976 is introduced, superseding BS3628:1963. In 1983 HM Queen Elizabeth II visited Jubilee’s premises to see how the company helped the regeneration of Medway towns. Jubilee® Clips’ quality was recognised when it became one of the first companies to be awarded BS5750 for its production Systems. John Jennings was appointed Managing director following John Lumley-Robinson’s retirement. 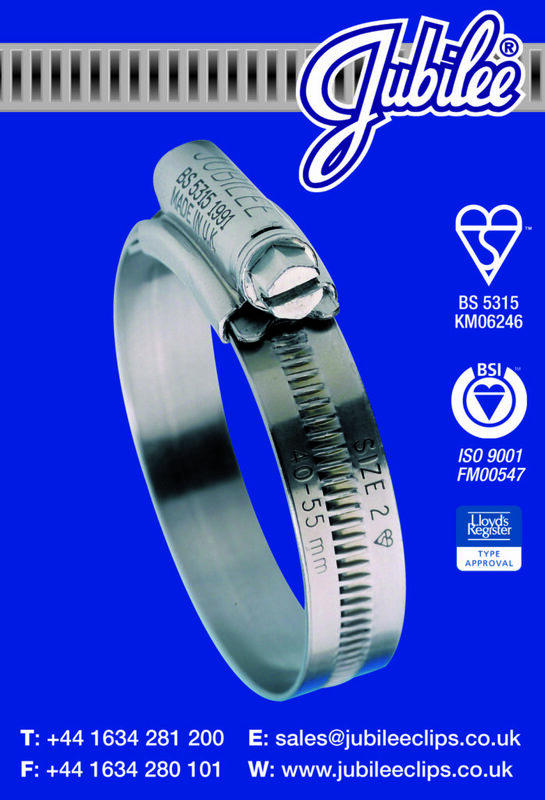 Jubilee® Clips were granted the Kitemark for the revised BS5315:1991 for hose clamps up to and including 1000mm in diameter. 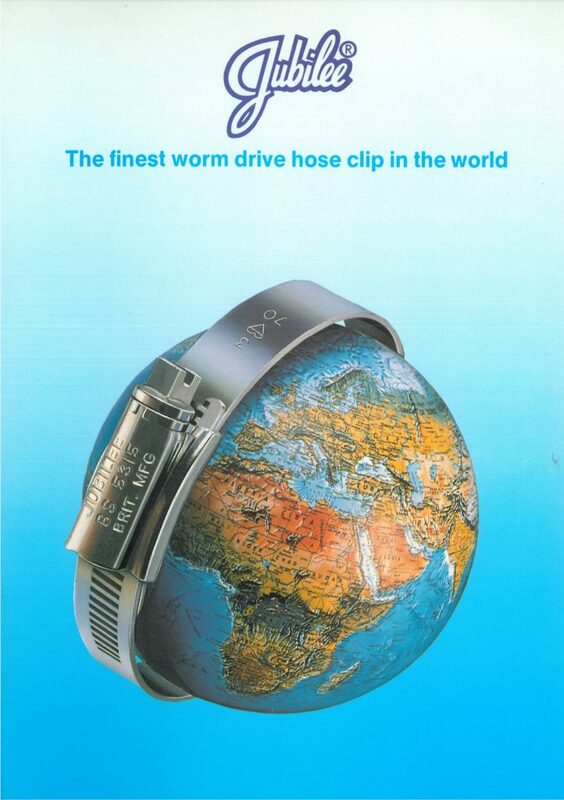 Jubilee’s 304 stainless steel worm drive range was given Lloyds Register approval in 1996. 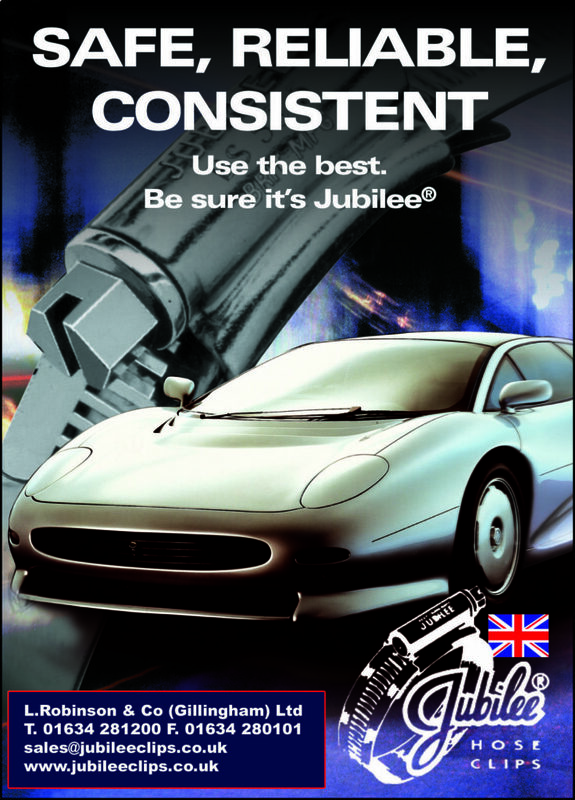 Jubilee® Clips expanded its range of hose clips to include Superclamps, O-Clips and High Torque clips. Jubilee® Clips moved into new 40,000 sq ft site, able to accommodate all manufacturing and technical facilities of the group in a single location for the first time since the company was founded. Lloyds Register approval was extended to include Light Range clips in 304 and Original Range clips in 316 stainless steel. The great grandson of the Jubilee® Clip Inventor, Ian Jennings, was appointed joint Managing Director making him the fourth generation of the family to hold this position. Elms Lightning Fasteners in Birmingham, producer of the Multiband cut-to-length banding system, was acquired, expanding Jubilee's product range and further enhancing the manufacturing capabilities of the group. Jubilee® Clips' range of banding products was extended to include Multiband in 316 stainless steel and the Flexiband band and buckle system.